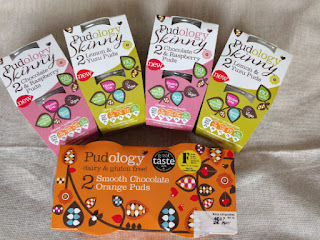 Pudology, makers of gluten free, dairy free and free-from-refined sugars luxurious desserts, have introduced two new varieties that even those watching their weight can enjoy. The new desserts are called Pudology Skinny and they’re available in two varieties: Lemon & Yuzu Puds and Chocolate & Raspberry Puds. They’re both gluten and dairy free, but they’re also low in calories with just 60 calories and 59 calories per pot respectively. 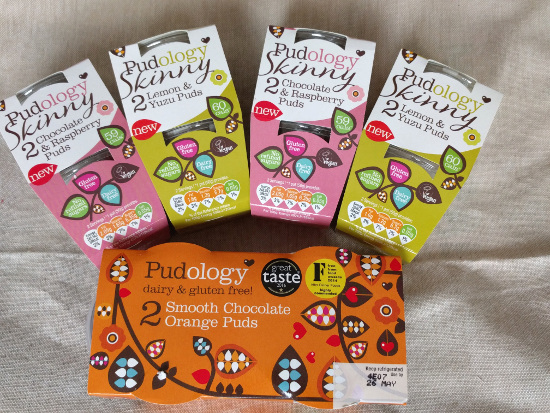 I was happy to receive some samples of the new range of skinny desserts from Pudology. I had previously noticed Pudology desserts during my supermarket trawls, however, I haven’t seen tempted to buy any, mainly because they’re high in calories. But the new Pudology Skinny puds are served up in tiny pots (50g) so it’s really quite easy not to overindulge. I tried the Lemon & Yuzu Pud first. Described as ‘A coconut & lemon dessert with yuzu juice & Sicilian lemon oil’. Because they’re so small, it’s best to eat them with a teaspoon and take very tiny amounts at a time. The top of the dessert has a firmer crust, a bit like you find on clotted cream. 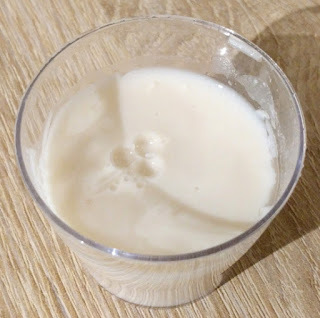 I think this is the coconut cream (which it’s made from) which has risen to the top and set. It’s gorgeous! The dessert is smooth and creamy, with a slight lemon tang. It tastes like lemon cheesecake. Absolutely delicious. I had no idea what a ‘yuzu’ was so had to look it up. Apparently it’s mainly from Japan, Korea and China and is likened to a cross between a mandarin and lemon. The Chocolate & Raspberry Pud was next. 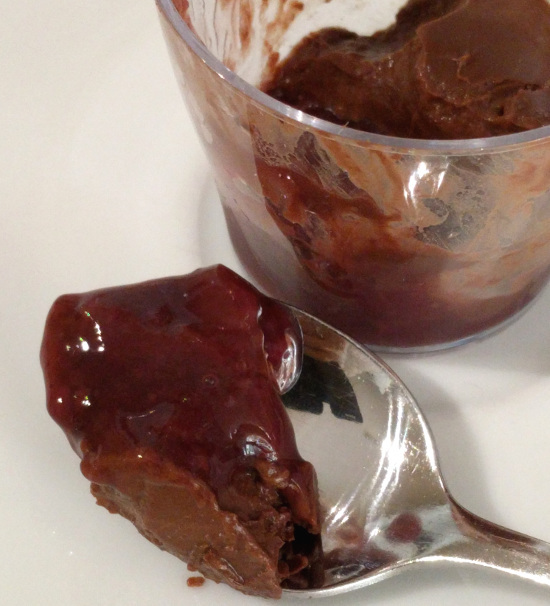 It’s described as: ‘A coconut & chocolate dessert with a raspberry sauce’. It’s similar to the Lemon & Yuzu in that it’s made predominantly from coconut milk. The top layer is again set, with a smooth, thick layer of rich chocolate ganache and tastes incredibly indulgent. Then at the bottom is a layer of raspberry puree. Heaven! All the family loved them. Eldest daughter, who's following the 5:2 diet, was overjoyed to be able include one of these in her menu. Even my youngest who dislikes all berries, loved the chocolate pud with raspberry puree. These desserts are suitable for those who aren’t able to tolerate or are cutting down on gluten. They’re also for those who can’t digest lactose or going dairy free and who can’t eat eggs. And of course, they’re helpful for those on a weight loss or weight maintenance diet because they’re portioned controlled to be low in calories. Although free from refined sugar, that doesn’t mean they’re sugar free. Sweetness is achieved from coconut blossom sugar, apple juice or agave. They’re both in the medium traffic light category for sugar and per pot, have a little over a teaspoon worth of sugar. I don't usually eat desserts like these, but the perfect portion control coupled with an ingredients which is not a million miles long and doesn’t read like a chemistry book, has totally converted me. 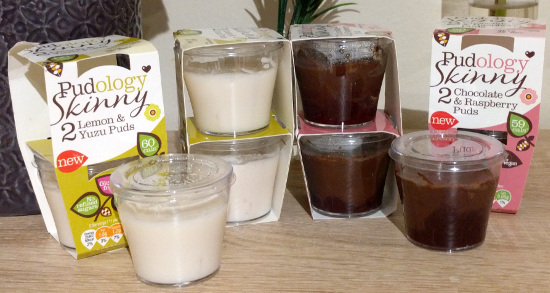 I was sent these sample for review purposes and always give my honest opinion, even when I don’t like something. In the case of these desserts, I can’t fault them. If I’d seen them in the supermarket I would have purchased them anyway and I will certainly be buying them when I next do my family shopping. 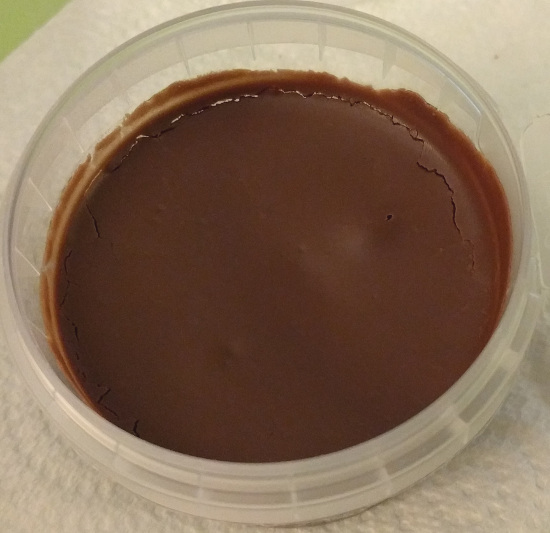 I was also sent a sample of Pudology’s Smooth Chocolate Orange puds. Like the Skinny versions, they're made from coconut milk and are gluten and dairy free. These are not low calorie with 260 calories per 85g pot. I tried a little bit and, wow, this one tasted like pure melted chocolate orange. I let hubby finish it off! 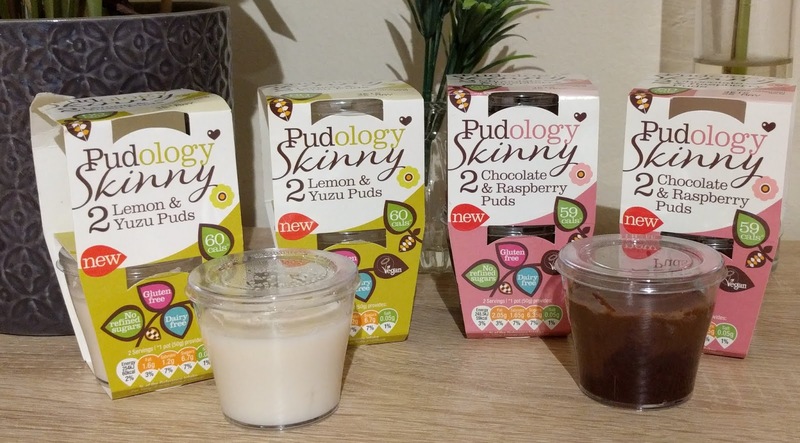 The Skinny Pudology range will be sold in Sainsbury’s stores (currently in 88 stores) as well as selected Waitrose stores for £1 per two pots. Ingredients: Lemon & Yuzu Puds: Coconut water, organic agave nectar, coconut cream (12%) (coconut water), lemon juice (95%), potato starch, potato protein, yuzu juice (2.5%), Sicilian Lemon Oil. Nutrition: Lemon & Yuzu Puds per 50g pot: 60 Calories, 1.6g fat, 1.2g saturated fat, 11.1g carbs, 6.7g sugars, 0.6g protein, 0.2g fibre, 0.05g salt. Ingredients: Chocolate & Raspberry Puds: Chocolate ganache (71%) (Coconut water, coconut cream (14%) (coconut water), potato starch, potato protein, cocoa, coconut sap, dark chocolate (1%) (cocoa mass, coconut blossom sugar (33%), cocoa butter)), raspberry compote (29%), (raspberries (50%), apple juice concentrate, water, cornflour, lemon juice concentrate, natural flavourings, gelling agent: pectin, colour (anthocyanins), yuzu juice (2.5%), Sicilian Lemon Oil. Nutrition: Chocolate & Raspberry Puds per 50g pot: 59 Calories, 2.05g fat, 1.65g saturated fat, 9.7g carbs, 6.35g sugars, 0.95g protein, 0.9g fibre, 0.05g salt.